Every year, I always try to do something new. This often ends up being something that requires me to learn a little something, and invest a lot! For example, in 2014, my first year running my business, it was making paper flowers. I learnt how to construct them, and bought lots and lots of tissue paper, bottles of bleach, and even a paper cutting machine. Last year I had the amazing opportunity to be involved in Fashfest, which led to me learning how to handle silk flowers and create fashion pieces with them, including buying and using new tools, and a LOT of silk flowers. This year, I’ve decided to focus on further developing my jewellery making skills and using higher value materials. I work a lot with artistic wire, and I absolutely love it with all my heart. But as I’ve improved my techniques, I’ve become more interested in making jewellery that my clients will be able to keep and cherish forever because of their higher level of workmanship, value and beauty. I’ve invested in buying amazingly beautiful gems and learning how to work with sterling silver wire. Making the change from working with artistic wire to silver wire feels like learning to walk on a tightrope. I have to try and keep the wastage of wire to an absolute minimum because of the value of sterling silver. It’s difficult, so I have to carefully watch what I’m doing to try and avoid making silly mistakes. This year I’ve also been very inspired by a book that my husband gave me at Christmas, Flora: The Art of Plant Exploration, by Sandra Knapp. It’s a beautiful book that explores the history of plants and flowers through botanical illustrations and essays. At Christmastime, our family friend Meg noticed that I couldn’t put the book down and said I needed to do something with the pictures in it. At the time, I couldn’t think of what to do, but now that I’m moving to making precious jewellery, they fit together perfectly. My idea is to take the ‘essence’ of the floral pictures and translate them to jewellery, primarily in the colour and arrangement of gemstones. Botanical illustrations are a perfect medium to gather inspiration from because they tend to show off subtle features of plants quite bluntly. I’ve been enjoying this jewellery making process immensely. One of the first pieces I made in this series is a necklace based on an image of a stem of a white magnolia flower. Magnolia leaves are unique in that they have a strong shiny dark green top that faces the sun, with an underside that’s a softer velvety brown texture. 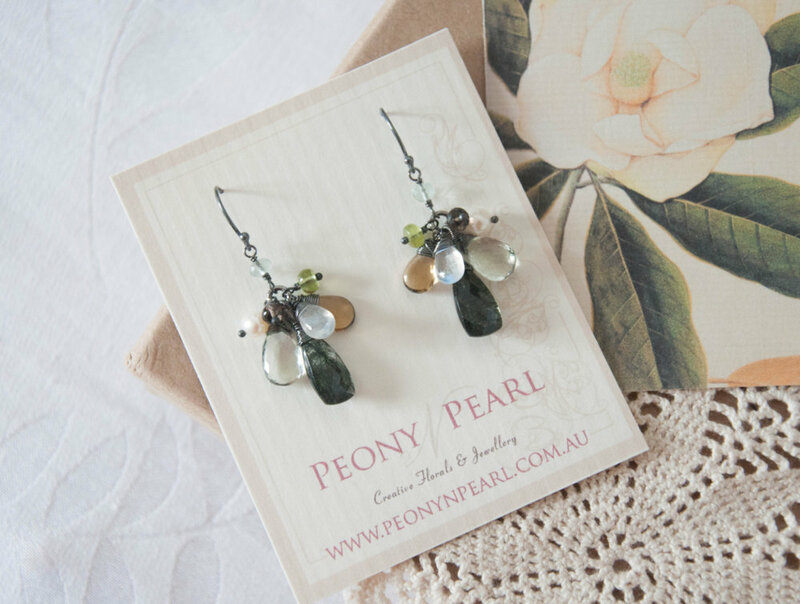 Translating this into jewellery, I found that the dark green of the leaves matched perfectly with rutilated moss gemstone and dark green tourmaline, and the brown underside with beer quartz. I represented the amazing grandeur of the pure white magnolia with a moonstone. And finally, because the magnolia flower is quite fleshy, almost lustrous in a way, I decided to include a freshwater pearl. The metal component for this piece, and this whole series of jewellery, is predominantly oxidised sterling silver. I was excited to learn how to oxidise silver. After oxidising the silver, I also polished it slightly to give it a touch of silvery shine against the dark grey. At this stage I think this is the best colour to highlight the colours of the gemstone, and it looks great against paler skin. 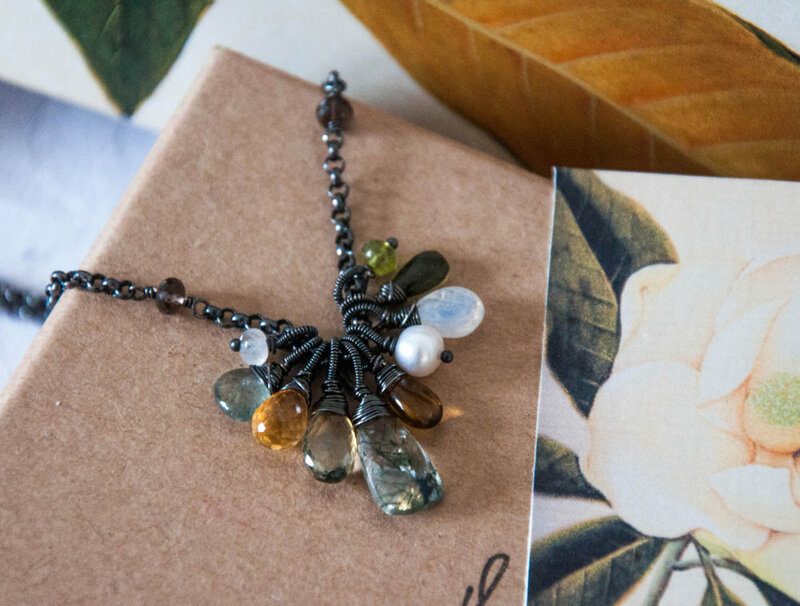 When I finished this necklace, I felt like I could almost smell the fragrance of the magnolia. That’s when I knew I was satisfied with the end product. I then showed it to some friends and asked for their opinions. One of them commented that it was like a metaphor for a flower that lasts forever, which I think is just beautiful. I’ve now made a few jewellery pieces in this series in preparation for the Handmade Market this weekend. More often than not, I’ve found that the colour of the gemstones and the illustrations match perfectly. I find it so amazing that nature can find a way to repeat itself in the most wonderful form. It’s filled me with so much happiness to be able combine flowers and jewellery—two of the things I love most—together. I have a feeling that this project may never end. I’ll be showing (and selling) my new series of jewellery at this weekend’s Handmade Market. I'm aiming to have jewellery made based on 10 different flower illustrations before the weekend! I can’t wait to see what you all think of it, and I hope you love it as much as I do.